The Southern California Sun were off to a 3-1 start in the second World Football League season as they hosted the Philadelphia Bell on August 29, 1975. Under the guidance of Head Coach Tom Fears, the Sun were benefiting from the presence of rookie RB Anthony Davis, a local star out of USC who had spurned the New York Jets to become the troubled WFL’s lone high-profile rookie signing for ’75. It had been anticipated that ex-Raider Daryle Lamonica would take over at quarterback for departed 1974 co-MVP Tony Adams, but injuries kept him off the field and another rookie from Southern Cal, Pat Haden (pictured at right), stepped into the starting role after overcoming a preseason injury. But while the offense could put points on the board, there were concerns about the defense, especially when star DT Dave Roller was knocked out of action with an injury the previous week. Philadelphia had undergone coaching turmoil during the preseason, but was now guided by ex-Green Bay Hall of Famer Willie Wood, a pioneering African-American head coach. The Bell had also picked up QB Bob Davis from the Florida Blazers, who beat out the flamboyant Jim “King” Corcoran for the starting job, as well as RB J.J. Jennings from Memphis and TE Ted Kwalick from the NFL 49ers. The Bell came into the contest at 2-2. There was a paltry crowd of 17,811 on hand at Anaheim Stadium for the Friday night game. Philadelphia had the first scoring opportunity, but a 38-yard field goal by Bob Cooper was nullified by a penalty and the follow-up attempt was blocked. On Southern California’s first play, Anthony Davis threw an option pass to wide-open WR Dave Williams that resulted in a 51-yard touchdown. Davis successfully ran for the action point (in the WFL, touchdowns were good for seven points and were then followed up by an “action point” that could not be kicked). It was the beginning of a big first half for the 10th-year veteran Williams. The Bell evened the score when RB John Land ran for a two-yard TD to cap a seven-play, 54-yard drive, followed by Bob Davis throwing to Land for the action point, but the Sun came right back when Anthony Davis returned the ensuing kickoff 84 yards for another touchdown. While they failed to convert the action point attempt, the Sun had a 15-8 lead – and had run just one play from scrimmage. Before the first quarter was over, Williams scored again to cap a 72-yard drive, this time on a pass from Haden that covered 37 yards. The Sun again failed to add the action point but still held a 22-8 lead. The Sun poured it on in the second quarter, with FB Greg Herd scoring on a one-yard carry set up by a pass interference call in the end zone (followed by a successful action point conversion on a run by backup QB Mike Ernst), and Williams adding two more TD catches from Haden on plays that covered 15 and 38 yards. Ted Kwalick caught a 16-yard touchdown pass from Bob Davis (and caught another pass to convert the action point), but Southern California maintained a solid 44-16 lead at the half. The Bell didn’t give up as Davis tossed three more touchdown passes in the second half, of eight yards to WR Ron Holliday in the third quarter and, in the final period, of 13 yards to ex-Eagles veteran WR Ben Hawkins and 49 yards to a future Eagles special teams star, WR Vince Papale. Two of the action point attempts were successful. The Sun added a one-yard TD carry by RB Bill Kramer in the third quarter and an eight-yard run by RB Gary Dixon in the fourth. Both action point attempts failed, but they weren’t needed as Southern California prevailed by a score of 58-39. To add insult to injury for the Bell, the local television station that was showing the game in Philadelphia pulled the plug on the telecast because it was running too late. The 97 points scored made it the highest-scoring game in the WFL’s brief history. The Sun rolled up 508 total yards – with 233 coming on the ground – to 436 for Philadelphia, trying vainly to play catch-up throughout most of the game. Southern California also had the edge in first downs (25 to 22) while the Bell led in turnovers (3 to 2) and penalties (14, at a cost of 152 yards, to 10 flags for 96 yards thrown on the home team). Anthony Davis (pictured below) had another noteworthy performance, rushing for 115 yards on 21 carries, throwing a touchdown pass, and returning a kickoff for another TD. Pat Haden completed 13 of 21 passes for 207 yards with three touchdowns and had one intercepted. Dave Williams was the receiving star with 6 catches for 179 yards and four scores. For the Bell, Bob Davis was successful on 21 of 46 throws for 285 yards and four TDs along with two interceptions. John Land ran for 55 yards on 12 carries that included a touchdown and J.J. Jennings was right behind with 10 attempts for 52 yards. Land and Ben Hawkins each caught 5 passes (for 44 and 42 yards, respectively) and Ted Kwalick gained 93 yards on his four receptions. Southern California compiled a 7-5 record and was in first place in the Western Division when the WFL abruptly folded in October. The Bell were at the bottom of the Eastern Division at 4-7. Anthony Davis was outstanding, comfortably leading the league in rushing (1200 yards), rushing touchdowns (16), and scoring (133 points) after 12 games. 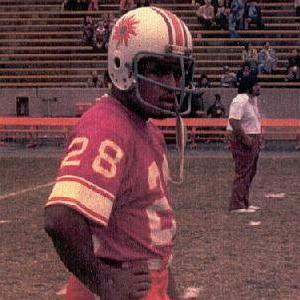 He went on to play in the CFL, NFL, and USFL, but never came close to the same level of performance. Pat Haden was off to Oxford as a Rhodes Scholar before the league folded, but would return to pro football with the NFL’s Rams for six years. Dave Williams finished off his pro career by catching 21 passes, 9 of which were good for touchdowns. He gained 327 yards (15.6 avg.) and the scoring reception from Anthony Davis was his longest of the year.